Picture this. Several tour buses are gathered on the street. Their deep engines are grumbling. They are lined up not to see the Grand Canyon, but a humble barber shop covered with stickers in Seligman, Arizona, along Route 66. Just as one of the buses rumbles off around a bend, it is replaced by the sound of a bicycle bell as 91-year-old barber Angel Delgadillo rolls up to his shop and glides to a stop. He has operated Angel’s Barbershop and Pool Hall since 1950 (now called Angel & Vilma’s Original Route 66 Gift Shop), and still occasionally cuts hair. Angel is famous along Route 66. His town of Seligman was bypassed with the completion of Highway 40 in 1978. This small-town barber refused to let his town die. 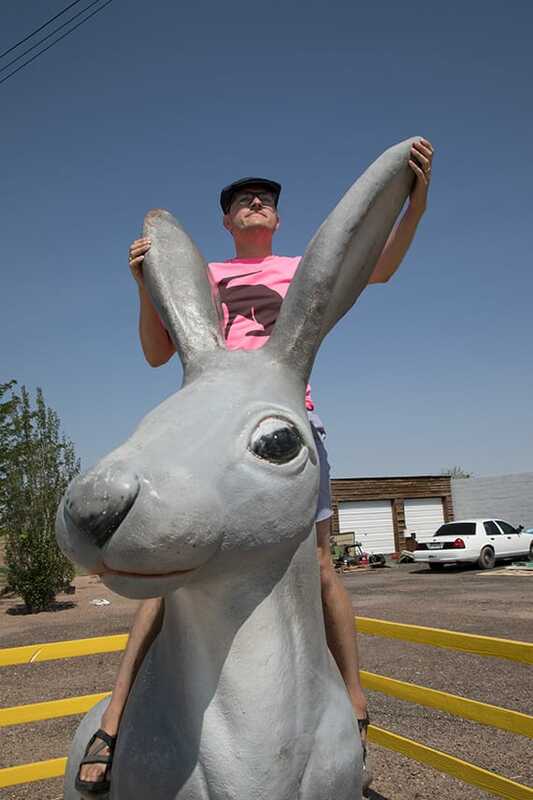 He formed the Historic Route 66 Association of Arizona and became its President. Now Arizona has preserved the longest stretch of Route 66. I’m led to Angel’s office. Hundreds of aging business cards cover a mirror. 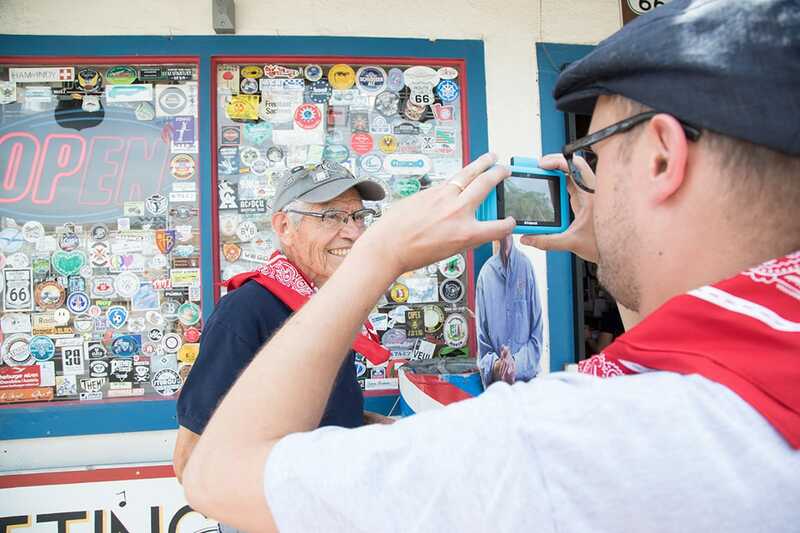 His barber certificate, many awards, and foreign posters of Route 66 adorn the walls. He tells us to have some coffee as he takes a seat in his barber chair. Angel speaks philosophically about Route 66. He gestures to punctuate his points like a conductor conjuring emotions of Americana. This raw passion for Route 66 is exactly what I saw at every stop along this ribbon of America. 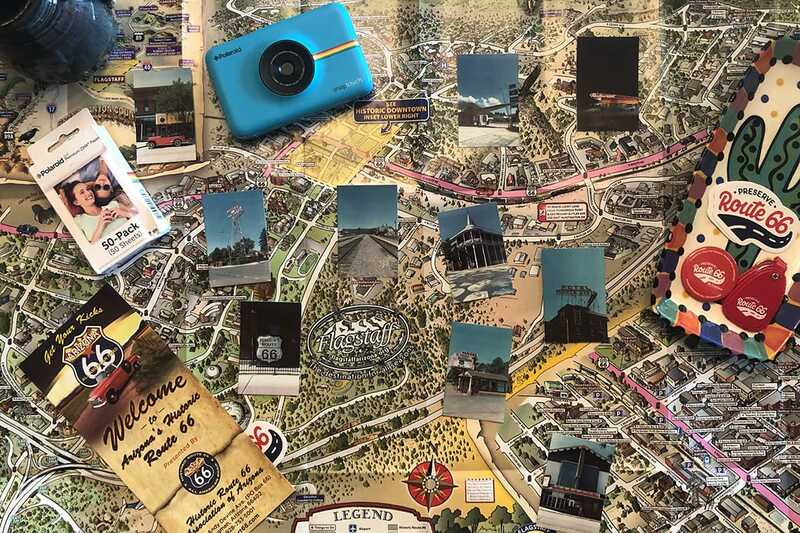 I was glad to have a Polaroid Snap Touch instant digital camera to document its history and architecture. Each building represents the hope of an individual to earn their living on the Mother Road. Some buildings live on like the Jack Rabbit Trading post and its now famous “Here It Is” sign (it was parodied in the Pixar film, “Cars”). 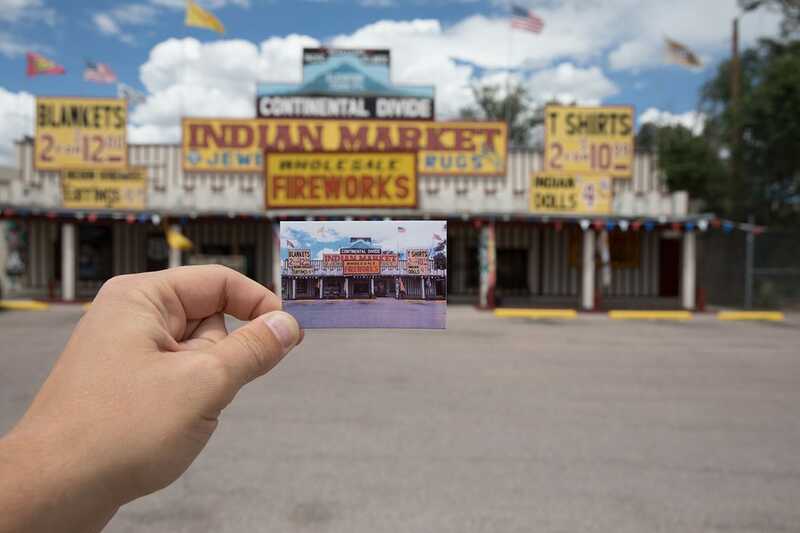 The current owners are the third generation in the family to run the trading post. 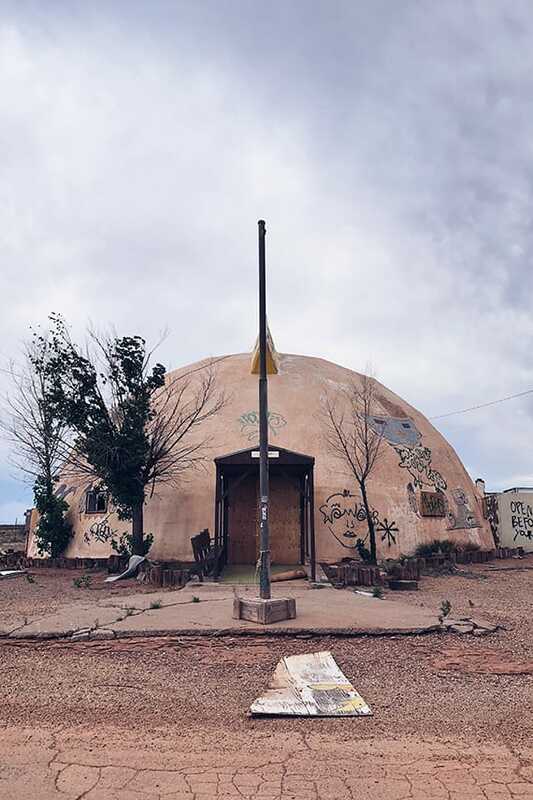 Others, like Meteor City, are falling into disrepair, but the ruins still inspire those driving by looking for a taste of America. The graffiti covering the walls have become an art statement of their own. 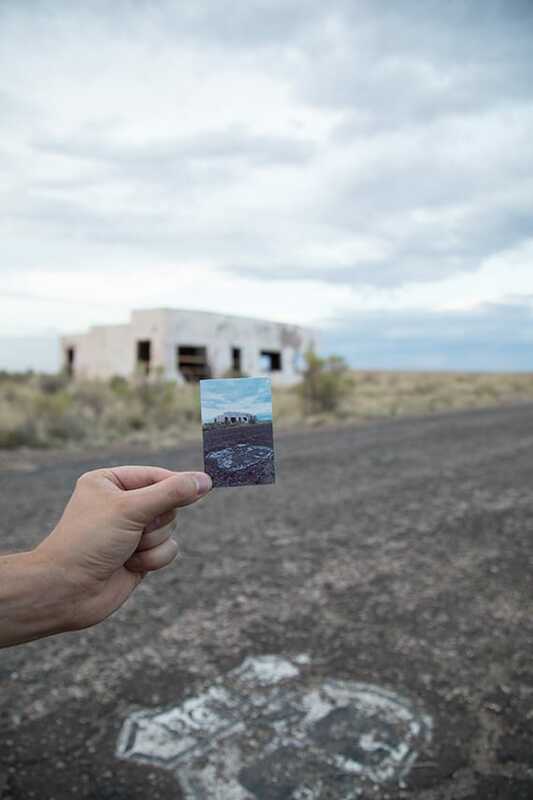 Rare roadside ruins spawn new creations. Giganticus Headicus stands guard over the Kozy Corner Trailer Court. 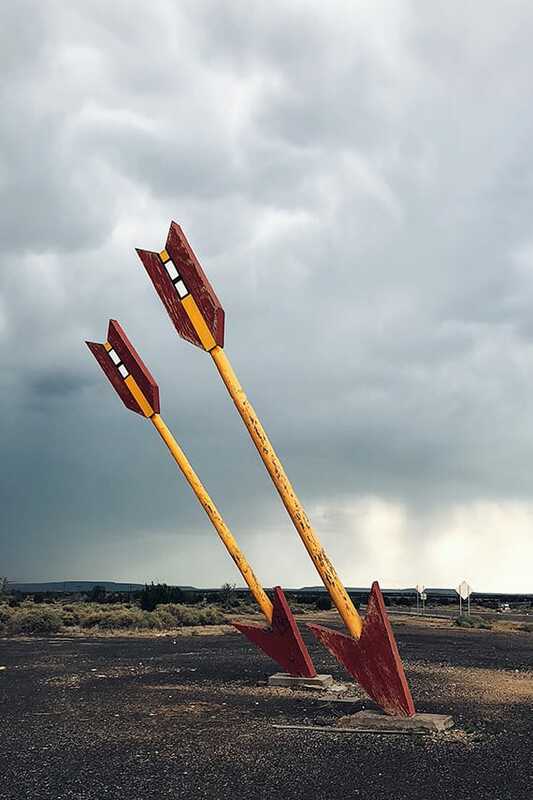 The green, 14-foot head was made in 2004 by Gregg Arnold and feels right at home among the kitsch of Route 66. 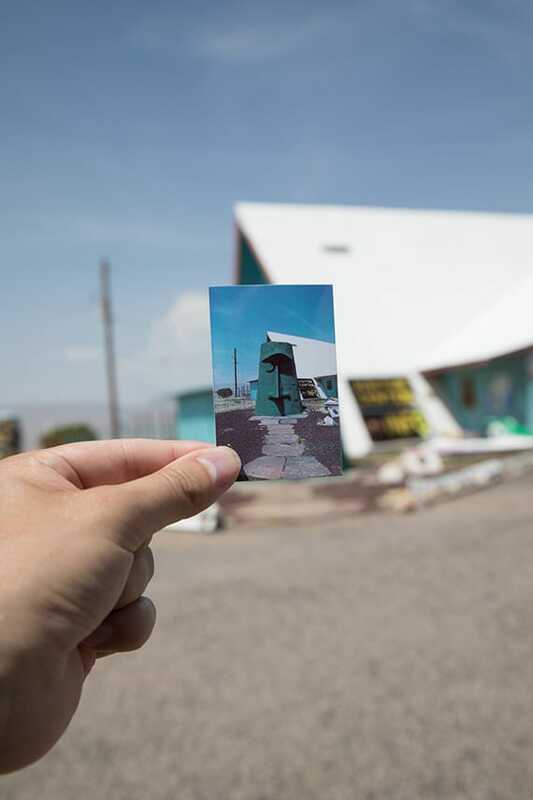 It is a newer, welcome addition to the roadside architecture family, and a sign that Route 66 is alive and well. Back in Angel’s office, he is talking about the Route 66 culture and how it compares to chain stores. When you go to a big chain, you are a number. 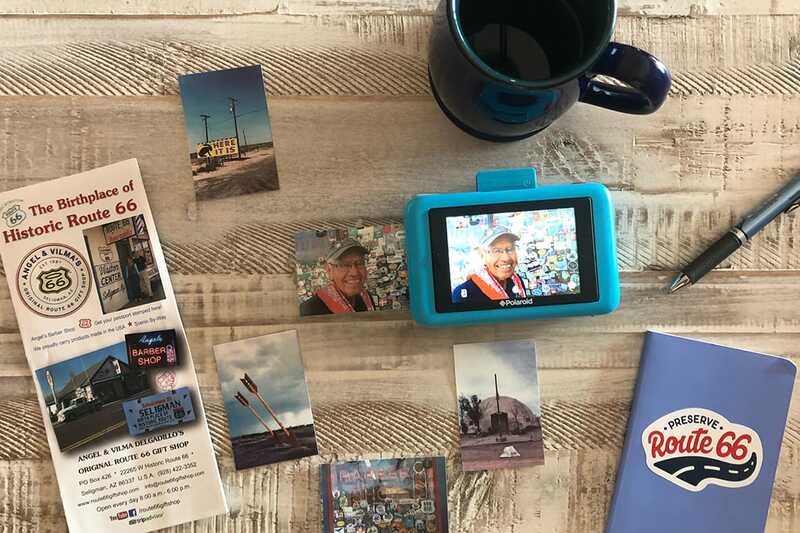 When you travel Route 66 you are part of the family. It’s about slowing down, having conversations, and being part of a community. 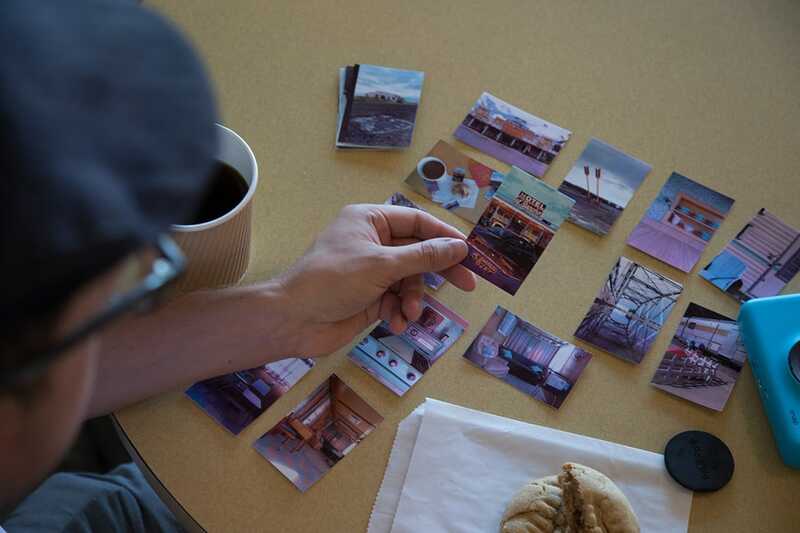 When you travel the route and strike up a conversation with a fellow traveler, its lore is passed down like a family story. This is exactly how we learned of the Enchanted Trails RV Park & Trading Post. Vicki, the owner, greets us as we walk into the lobby. 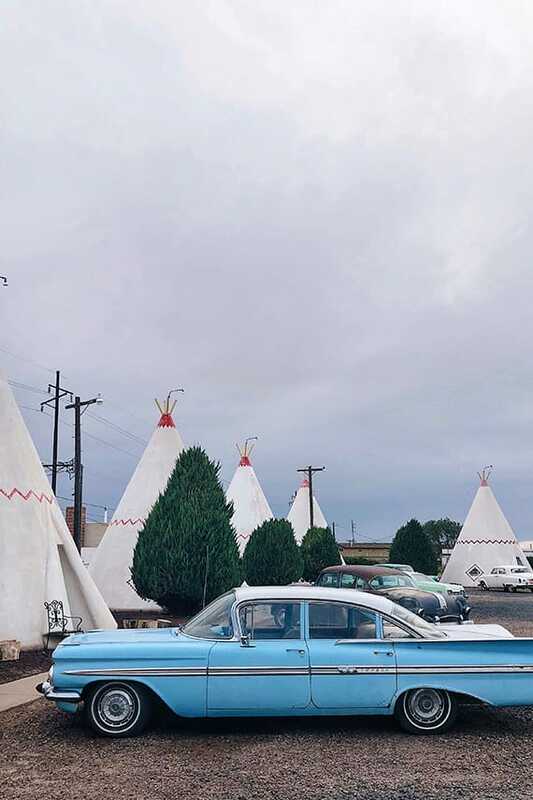 She started as the bookkeeper and fell in love with the culture of Route 66. She eventually purchased the park and now rents trailers for those seeking the classic aesthetic of Americana. We’re leaning in as Angel shares a story about keeping busy as a child in a small town. He would chase shadows that were formed by the headlights of passing cars. As the cars drove by his father’s shop, the shadows would dance and stretch along the whitewashed façade. This is Angel’s example of life, to live in the moment. Enjoy the conversations of the people around you because all the money in the world can’t buy these fleeting, precious moments. 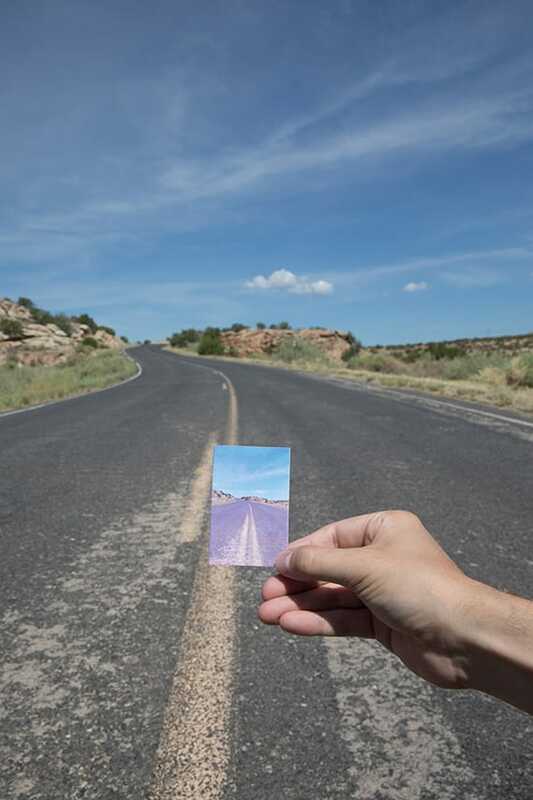 You don’t drive Route 66 to rush to a far-off destination. You drive it for the experience, to slow down and have conversations. You drive it for discovery. We stopped many times as we meandered the route. At every stop, I would jump out of the car with my Polaroid Snap Touch in tow. The process of snapping a picture and instantly being able to print the image meant I could capture a moment and share it with my new friends. Angel mentioned how excited he was to see our Airstream with the large Preserve Route 66 emblazoned on the side. 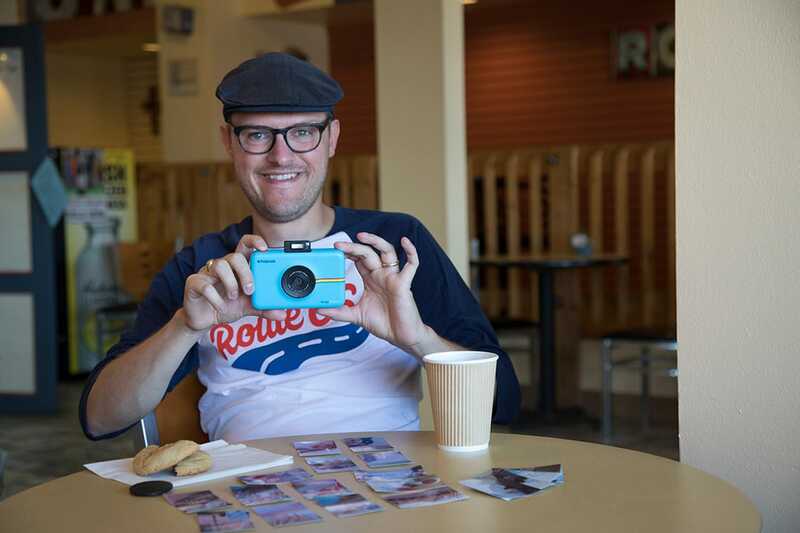 So we grabbed our Polaroid Snap Touch, snapped a picture and printed him two copies. 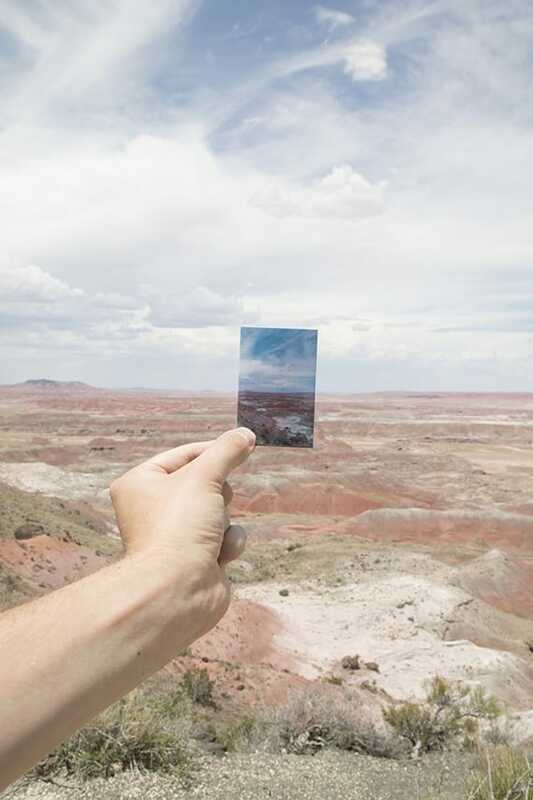 One for him, and one for his large visitors’ book that documents the thousands of people inspired by Route 66. As international tourists flow into Angel and Vilma’s, you can see that the world admires Route 66 as a symbol of America.